Instant Pot Appetizer Meatballs – The Perfect Dish For Any Party! 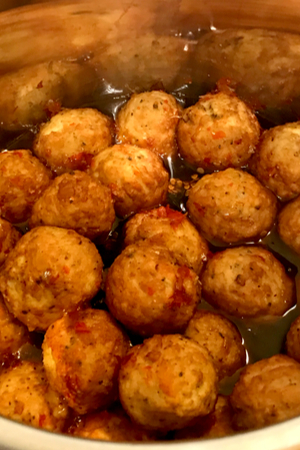 When I was asked to sign up to bring something to a lunch time work party, I quickly wrote down Instant Pot Appetizer Meatballs. Instant Pot Appetizer Meatballs on the plate and ready to be served. 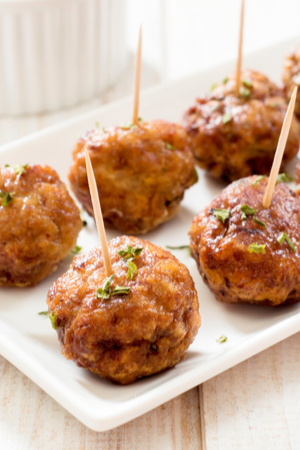 These sweet and spicy meatballs are always a huge hit at every get together. And I didn’t want anyone else to claim the rights to bring them. In fact, they are so popular I always get requests from friends and family for the recipe during the party. I am a little embarrassed to give them the ingredients list. Besides the meatballs themselves, you only need grape jelly and chili sauce. Grape jelly being added to the pot. The only thing easier to make is Candied Almonds. I used to make the meatballs in my slow cooker. They always turned out good – but I always had to guess when they would be done and ready to eat. Then I would forget to turn the slow cooker down to the keep warm setting and the edges of the meatball sauce would burn. So when I decided that I would bring the meatballs to work, I knew right away that I would make them in my Instant Pot instead. I have to admit, I was a little nervous. I had made dinner meatballs in the Instant Pot before and had good success. The meatballs were cooked with the marinara sauce on top. Add the chili sauce and water and stir the sauce until smooth. I didn’t stir the meatballs, just poured the contents of the jar on top. And they came out perfect! However, with this Instant Pot Appetizer Meatballs recipe, I knew that getting the dreaded BURN notice might be an issue. If you aren’t familiar with how an Instant Pot pressure cooker works, you might be wondering what I mean. 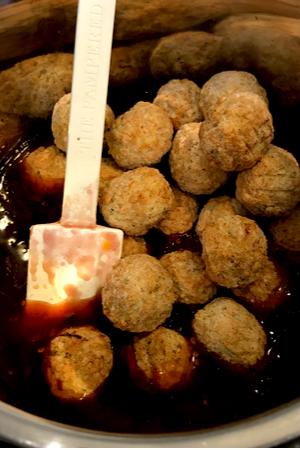 Frozen meatballs being dumped into the sauce. In order for the Instant Pot to work there must be thin liquid in the pot of the pressure cooker. This is essential because it allows the pot to pressurize and begin the cooking process. However, because the unit only heats from the bottom, any liquid that is too thick will burn to the bottom of the pot. The Instant Pot will give a display warning of BURN and now you have to depressurize the pot and become an investigator to save the recipe. There is no time for a burn warning on party day! Especially after bragging about how wonderful the Instant Pot is to anyone and everyone who will listen! After dumping the meatballs in the sauce, stir to coat. So when I was trying to convert my slow cooker recipe to the Instant Pot I had to take a hard look at the sauce ingredients. 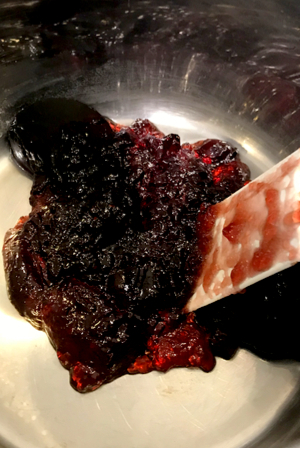 Grape jelly – yes, that is pretty thick. Chili sauce – a very sticky sauce. How in the world was I going to make this happen? I decided to add in a little water to thin the sauce out a bit. Once all mixed together, the grape jelly clumps broke down and the chili sauce blended well into a smooth, thin sauce. It was then that I had more confidence that this would work! 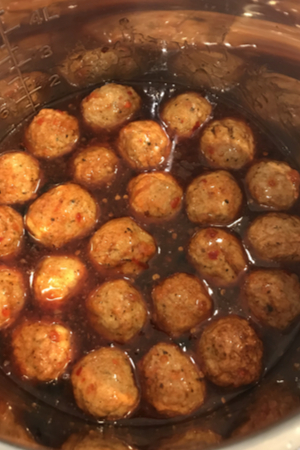 Cooked Instant Pot Appetizer Meatballs. I grabbed my precooked appetizer size meatballs from the freezer and kept my fingers crossed. With a watchful eye on the pot, I waited. I kept looking at the display hoping the only thing that I would see is the cook time. It took 7 minutes for the pot to come to pressure. The cook time countdown started, and we were on our way! I was ecstatic! My absolute favorite recipe to bring to a party was now converted to Instant Pot Appetizer Meatballs. They cooked perfectly! And I was able to keep them on the Keep Warm function so everyone had time to enjoy them no matter when they were able to attend the party. Now I can add this recipe to my go to Instant Pot appetizer recipes along with our other favorites including Nacho Dip. 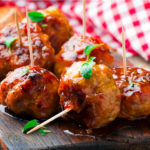 The classic party meatball appetizer with a simple sauce made with grape jelly and chili sauce. 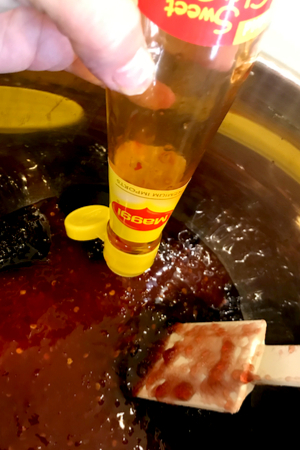 To the liner of the Instant Pot, add jelly, chili sauce, and water in the Instant Pot and stir until smooth. Add meatballs and mix well. Pressure cook/manual on HIGH pressure for 7 minutes.